Now here is a wine I can get behind. I am a huge Beau fan and the 2001 is my favorite vintage of the past 20 years. 00, 98, and 95 are great and I think the 2010 has serious potential. With all Beau beware of brett…especially in the 95. I really liked where this wine was when we drank it. The nose and flavors on the palate were a perfect match: dark fruits and spices leading into rich earth and leather….classic CdP. Tannis are just right. Great layers and complexity on the palate…makes you completely forget it’s 13.5% alcohol. The finish is long and strong (ha) wrapping up the experience in a nice little bow. This is ready to drink now…right where I like my CdP…but still has plenty of time left. One of the best wines of 2013. Right now I’m leaning towards 89 Pichon, 01 Beau, and 99 Montruc as my top 3. 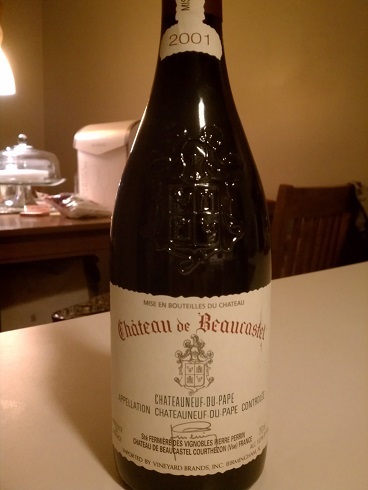 This entry was posted in Chateauneuf du Pape, France, Grenache, Mourvedre, Rhone, Syrah on October 26, 2013 by colonelgrape.